Batting stars: Rod Carew was 3-for-4 with a double. Leo Cardenas was 2-for-3 with a walk. Ted Uhlaender was 2-for-4 with a stolen base, his sixth. Pitching stars: Tom Hall pitched 6.1 innings, giving up three runs on six hits and a walk and striking out three. Bob Miller pitched 1.2 scoreless innings, giving up a walk. Opposition stars: Mel Stottlemyre pitched a complete game, giving up one run on nine hits and a walk and striking out three. Bobby Murcer was 2-for-4. The game: Another game of missed opportunities for the Twins. Uhlaender and Charlie Manuel got one-out singles in the second, but a double play ended the threat. An error and a Rod Carew single put men on first and third with two out in the third, but a ground out ended the inning. The Yankees had their first scoring threat in the fourth, and they cashed it in. Joe Pepitone delivered a two-out single, driving home Murcer with the first run of the game. The Twins tied it in the sixth, but it really was yet another missed opportunity. Carew led off with a double and Tony Oliva singled, putting men on first and third with none out. Harmon Killebrew hit into a double play, scoring the run but killing the rally. The Yankees went into the lead to stay in the seventh. Billy Cowan led off with a single and Frank Fernandez drew a one-out walk. Bill Robinson then had an RBI double, ending Hall's day and bringing in Miller. He intentionally walked Bobby Cox, but Stottlemyre foiled the plan with a sacrifice fly, making it 3-1. The Twins did not get a man past first after that. WP: Stottlemyre (7-3). LP: Hall (2-2). S: None. Notes: Cesar Tovar was at third base, with Killebrew at first. Manuel was in left field. Carew raised his average to .393. Manuel was 1-for-4 and raised his average to .326. Oliva was 1-for-4 and was batting .300. Miller's ERA fell to 1.80. The Twins had nine hits and a walk, but scored only one run. They had eight singles and one double. They hit into three double plays and were 1-for-7 with runners in scoring position. The one hit was Oliva's sixth-inning single, which did not produce a run. The Twins had lost seven out of eight games. They had scored nineteen runs in those eight games, eight of them in one game. 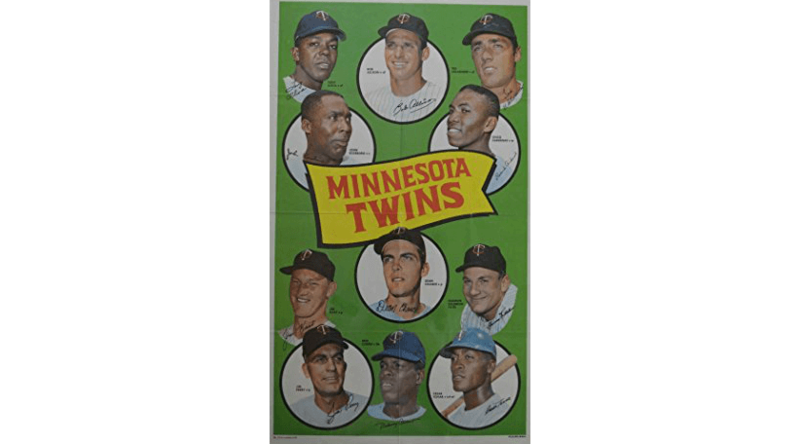 In their defense, the Twins continued to face some good pitchers. Mel Stottlemyre pitched mostly in the Horace Clarke Era of Yankee baseball, so he only got into the post-season once, in 1964, which was his rookie season. Despite playing for some bad Yankee teams (it feels so good to write the phrase "bad Yankee teams"), he won 21 games in 1968 and 20 in 1969. He also lost 20 games in 1966 and led the league in losses in 1972 with 18 despite posting an ERA of 3.22. He led the league in complete games twice, with 18 in 1965 and 24 in 1969. He made the all-star team five times. His career won-lost record is 164-139, but his career ERA is 2.97. He pitched for eleven seasons and does not appear to have lost anything in his last season, 1974, but he tore his rotator cuff and in 1974 there was not a lot that could be done about that. It's hard to feel sorry for a Yankee, and obviously it's not like he's had a tragic life or anything. But still, had Stottlemyre not torn his rotator cuff, or had he come up to the Yankees in just about any other era, he might well be in the Hall of Fame. Record: The Twins were 20-16, in second place in the American League West, one game behind Oakland.